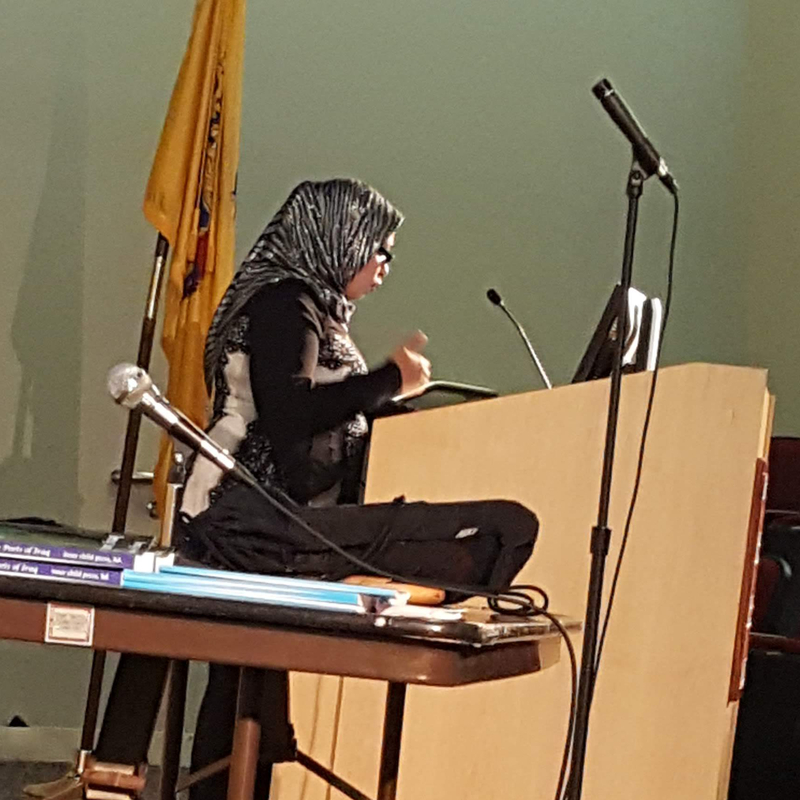 BLACKWOOD – Faleeha Hassan, an award-winning writer from Iraq, read some of her published works and participated in a question-and-answer session on Nov. 20 on Camden County College’s Blackwood campus. The gathering was hosted by the Madison Literary Society. Reading from her book “Breakfast for Butterflies,” Hassan shared poems of a war-ridden Iraq, all of which she said are based on personal experience. “I cannot sit and write poetry. I write about what happened to me,” Hassan said. Hassan immigrated from Iraq first to Turkey in 2011 and then the United States a little more than a year later. Upon arrival in the U.S., she said, she found out her name was on a “death list” because of her writings. The list was updated three times since and each time her name still appeared on it, she said. Hassan told the approximately 30 people in the audience that many of her friends, including other writers, have been killed or gone missing after appearing on the list. The coordinator of the event, Camden County College Professor Keith O’Shaunessy, began the event by reading one of Hassan’s poems, “The Futility of Protesting Near Bustling Cemeteries.” Mentioning the fact that Hassan has frequently been referred to as “The Maya Angelou of Iraq,” O’Shaunessy encouraged attendees to start calling Maya Angelou “The Faleeha Hassan of Iraq.” The audience, in a mix of laughter and awe, indicated agreement with the notion, showing their adoration and interest in her work. Hassan has 22 published works that include novels, poems and plays. Her works have been translated into 15 languages, some from Arabic and more recent works from English. In 2018 she was nominated for a Pulitzer Prize and has received more awards than she can remember off the top of her head. She has several plays on stage around the world and has been told one of her novels may be made into a movie.